Thanks, Fox News, for yet another reason not to tune in to your station and instead wait for your clips to pop up on my twitter feeds and in Facebook messages from friends. Thanks for yet another bit to use with youth and adults alike when discussing how our nation still wrestles with racism and deep-seeded bigotry. Thanks for the clip that will certainly be used in a class I will facilitate this Sunday, "Santa's Real: The Man Behind the Myth." 1. Santa was not white. St. Nicholas was likeley Mediterranean and/or Middle Eastern. Nicholas of Myra looked nothing like me nor any of your homegenous panelists. So, for all you kids and Fox News show hosts, Santa just wasn't white. Coca-Cola's version may be, but the great Wonderworker of the fourth century- not likely. Just wanted to get that out there. 2. Jesus, also, was not white. Jesus was Palestinean Jew. In case you were wondering, that's not the same thing. I know we prefer to craft Jesus in our own image in efforts to leverage our agenda and privilege, but Jesus was born into an oppressed class of marginalized peasants. So maybe we should tilt our concern towards the same people groups as well. 3. Nicholas was not a Greek bishop. Nicholas was born in the latter portion of the third century C.E. in Patara, nearby Ephesus and situated within Asia Minor or modern day Turkey (see point 1). Also, St. Nick was a revolutionary, justice-seeking, philanthropical bishop of Myra. Again, not in Greece but Asia Minor during the peek of the Roman Empire. 4. Making Santa an inclusive holiday figure is not exactly a bad thing. The panelist you tried to squeeze out was actually on to something: the legend of St. Nicholas is elastic and our culture can handle diverse representations. In fact, this may be a great attempt to honor the late Bishop of Myra. If pain and isolation is caused to young kids because the cultural icon does not look like them, our greatest humanitarian and charitable deed may be to draw out St. Nick's alternative skin tone. Again, the Bishop probably had a darker complexion anyway. 5. The one thing you got right, Santa Claus is not a penguin because, as you eloquently stated, the birds can neither fly nor lug around all those gifts around the world. But your white Santa, now that's apparently another story. Blessed Advent and May All Your Christmases be, well, welcoming to all God's people- especially the poor, oppresed, and any wrestling with deep and real pain. Article referred to by Aisha Harris, Santa Claus Should Not Be White Anymore. I do not subscribe to Harris' "Penguin Claus" proposition, but I wonder if this is more satire and tongue-in-cheek that Fox missed. Regardless, her points are fair and worth pondering over with greater felxibility and humility than what was offered by Fox. 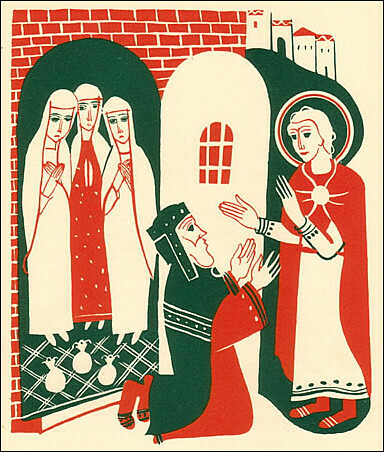 Click Here for Handout for "Santa's Real: The Man Behind the Myth"
Above image is of the legend of St. Nicholas delivering three young women from being sold into prostituion due to their father's bankruptcy. The kneeling figure is the father expressing gratitude for Nicholas generous offerings that, legend has, were thrown through his window and landed in the daughters' stockings hung up to dry. See St. Nicholas Center website for other images.